PRODUCT DESCRIPTION:Silver-backed glass provides you with a clear, crisp and flawless reflection.Perfect Lighting for Make Up and Hair - You can press switch button for three second to dimmer the brightness of mirrors - Shows Your True Colors.Eco-friendly and environmentally responsible,Honeycomb carton box for protection.LED light source creates bright, energy-efficient illumination.A safe, innovative heating-coil pad keeps it free of condensation.Round on/off sensor dimmer and cool natural white light.90 CRI (color rendering index) for great contrast between colors.Materials: 5mm eco-friendly silver mirror ; 120 Leds High brightness 2835 led strip.MIRROR SPECIFICATION:Installation: hanging horizontal, including plug and screws Power Source: input 100-250v, 50/60HZLumen: 13000LMColor Temperature: 6000KSize: 48"width, 36" height, with touch button, dimmer three kinds of light intensityMirror Thickness: 1.5" totallyMirror Weight: 53 lbs. PRODUCT DESCRIPTION: Silver-backed glass provides you with a clear, crisp and flawless reflection. Perfect Lighting for Make Up and Hair Eco-friendly and environmentally responsible, Honeycomb carton box for protection. LED light source creates bright, energy-efficient illumination. A safe, innovative heating-coil pad keeps it free of condensation. 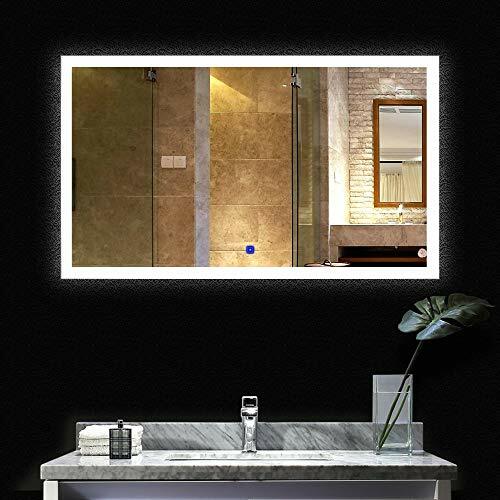 Materials: 5mm eco-friendly silver mirror; 120 Leds High brightness 2835 led strip. 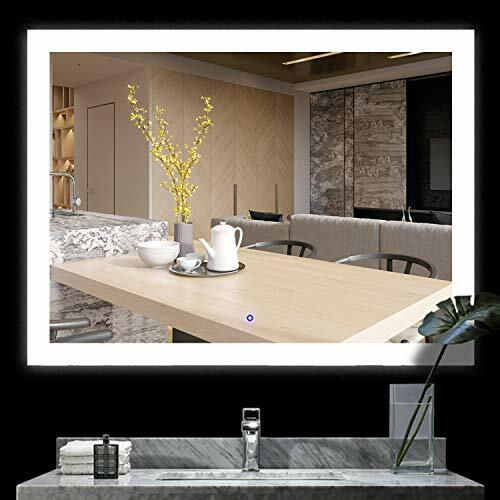 MIRROR SPECIFICATION: Installation: hanging horizontal, including plug and screws Power Source: input 100-250v, 50/60HZ Lumen: 11000LM Color Temperature: 6000K Size: 60"width, 36" height, with touch button, dimmer three kinds of light intensity Mirror Thickness: 1.5" totally Mirror Weight: 68 lbs. About Foo Dogs Foo Dogs is also called fu dogs,beijing lions, are traditional Chinese guardians.Foo Dog symbolized as powerful mystic guardian to protect a family wealth and social status.n ancient times, the Fu Dogs were always put in front of important places such as temples and government. Now they are still used to guard, such as in front of large estates, restaurants, banks, hotels and stores to ward off evil energy. 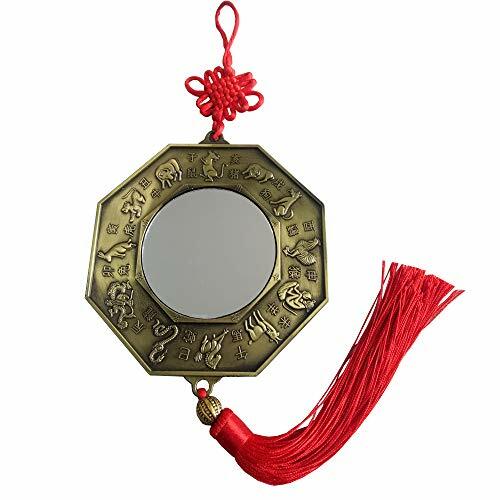 About Buagua Mirror In Chinese tradition, bagua mirror is usually used to change evil spirit and attract good luck. It can be hanged on the wall, on the door, on the rearview mirror of your car or anywhere you want to be protected and promote healthy and wealthy. 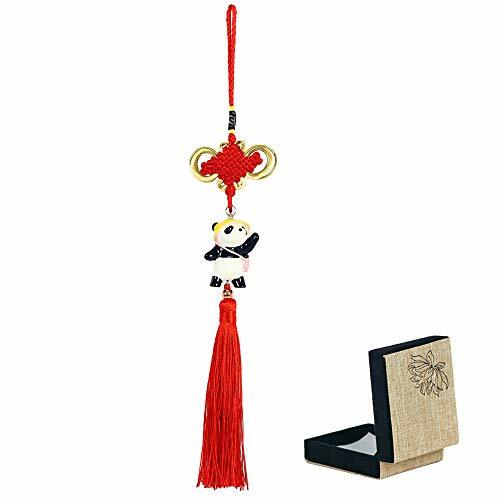 Bagua mirror with Chinese knot tassel can bring good fortune. 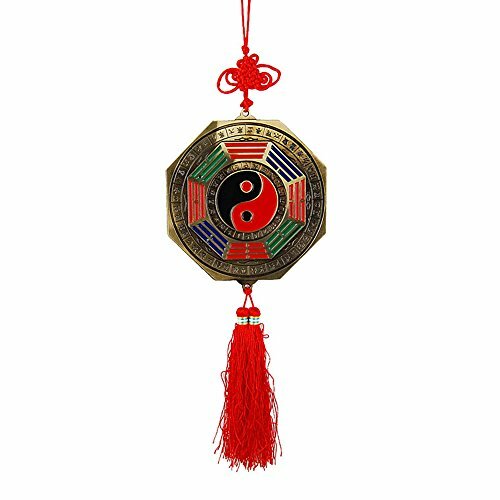 In Chinese tradition, bagua mirror is usually used to change evil spirit and attract good luck. It can be hanged on the wall, on the door, on the rearview mirror of your car or anywhere you want to be protected and promote healthy and wealthy. 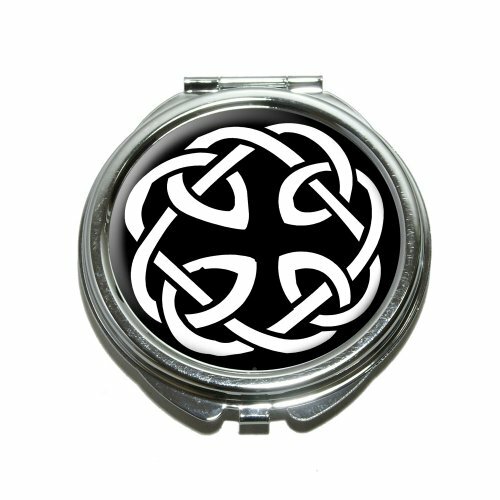 About The Product: This terrific compact mirror is super durable and is the perfect beauty accessory for your purse. The hinged lid is decorated with the resin-topped design as shown. The compact is made of chrome-plated metal, and is only about 0.25" (0.6cm) in depth. The mirrors are approximately 2.3" (5.7cm) in diameter.About The Design: This elegant knot is a symbol of love and eternity, with no beginning and no end. 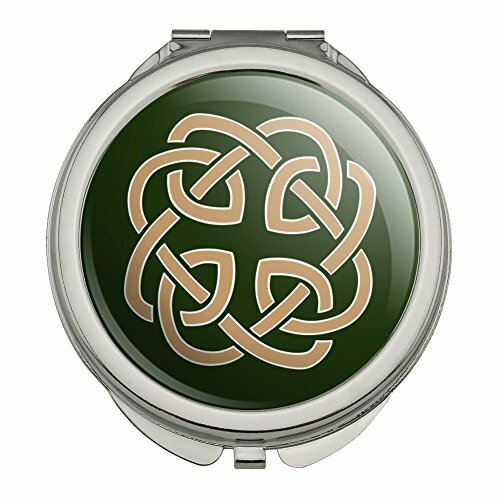 This terrific compact mirror is super durable and is the perfect beauty accessory for your purse. The hinged lid is decorated with the urethane encased design as shown. The compact is made of chrome-plated metal, and is only about 0.25" thick. The mirrors are approximately 2.25" in diameter. About Foo DogsFoo Dogs is also called fu dogs,beijing lions, are traditional Chinese guardians.Foo Dog symbolized as powerful mystic guardian to protect a family wealth and social status.n ancient times, the Fu Dogs were always put in front of important places such as temples and government. Now they are still used to guard, such as in front of large estates, restaurants, banks, hotels and stores to ward off evil energy. 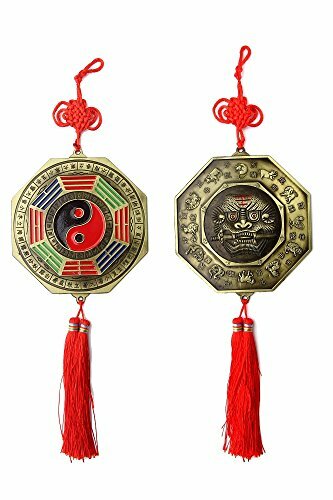 About Buagua MirrorIn Chinese tradition, bagua mirror is usually used to change evil spirit and attract good luck. It can be hanged on the wall, on the door, on the rearview mirror of your car or anywhere you want to be protected and promote healthy and wealthy. Car Charm With Aroma Vials The car carving pendant always hang in the front of the car for safe meaning, you can also hang it somewhere in your house, bathroom mirror, wall, living room, or use it as a tactile focal point during meditation. 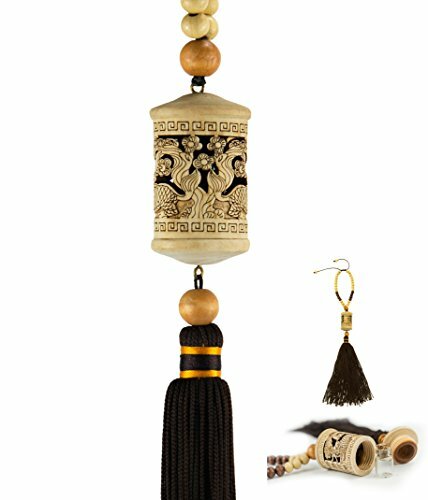 Chinese Style Pendant Tassels Package 1 Piece wood carving and tassel 1 Piece vials inside Please Note Due to handmade, some wood carved color will a little different. How To Open Cylinderdragon: The opening is at the bottom of the pendant. One hand holding the upper part, one hand holding the bottom, the upper part rotating to the right, the bottom rotating to the left. Calabash: The opening is at the middle of the pendant. One hand holding the upper part, one hand holding the lower part, the upper part rotating to the right, the lower part rotating to the left. →Any problems please contact us, we are glad to help. 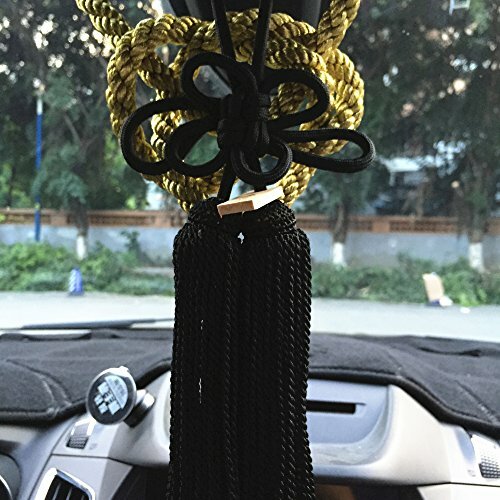 The package come with 1Pcs Rope and 1Pcs Kiku Knot and 2pcs small hooks ,you can stick on the front windshield,easy to install ! Compare prices on Knot Mirror at LiveSaler.com – use promo codes and coupons for best offers and deals. We work hard to get you amazing deals and collect all avail hot offers online and represent it in one place for the customers. Now our visitors can leverage benefits of big brands and heavy discounts available for that day and for famous brands. We try to makes comparison shopping easy with Product Reviews, Merchant Ratings, Deal Alerts & Coupons. Find Deals, Compare Prices, Read Reviews & Save Money.